Nurse.. scalpel, swab, suction...she's crashing! Quick! Page Dr Mike! 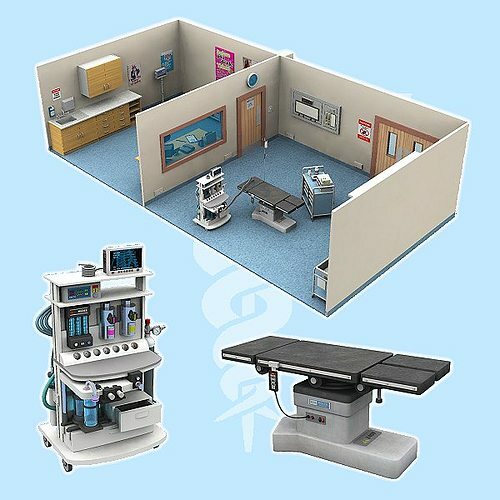 A set packed consisting of 2 rooms full of highly realistic medical equipment, including the stuff you'd find in any hospital or emergency room. The rooms feature accurate modelled details such as plug sockets, skirting boards and light switches. For maximum play value, the ceilings and end walls can be made visible with show/hide poses. * Operating Table - with control panel and loads of switches and knobs. * Resuscitation Machine - A precisely designed version of the machine that goes "ping". With all the details found on a real resus machine, such as wires, cables and monitors. This comes in 2 versions, one with a fixed breathing tubes and one where you can add the breathing pipes for various figures. * Drips: 1 empty stand, 1 with IV antibiotics bag and coiled line, 1 with a monitor and 1 with a blood bag and modelled line angled so it can go into your character. * 2 Machines: 1 small generic hospital equipment, not sure what it does but it looks good and 1 instrument with coiled probey thing. * Weighing Scales: Check your characters have gone easy on the chocolate. * Defibrillator: Available here in 2 flavours, 1 standalone and 1 defib on a stand with the paddles outwards ready to zap your people back to life. Comes with a M3 pose. * 2 wheeled Trolleys - 1 with a big tray for putting the squishy bits in. Plus 1 with items such as pill bottles, box of gloves and storage boxes and trays. * Doctors desk with a chair: The desk has a computer, phone, clipboard with patient notes, picture frame, pen holder with pencils, pen and a paperwork holder containing sample jars and prescriptions. * One empty room so those artists who like to "scratch build" can build scenes by adding props to suit. * One preset with a wide variety of things as parented props for easy adjustment. * One complete model with lots of things in one single figure. Sorry you feel this way, but the model was designed for use in Poser and it takes advantage of Poser's rendering features. Unfortunately, we didn't design it to be exported to other formats and we don't have any Maya developers available to adjust the model. Its ok. No harm ois done. The assets are in obj so you could rearrange them to maya users. Forthermore, dont know "poser" so i dont know if its possible. You can make FBX file for eche asset so it will be import to Maya with textures. I am saying this becouse this is a really great product and looking great with a great price. Thank you for responding:).